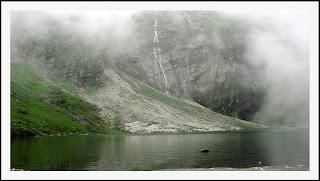 Hemkund is a glacier lake at 14,200 ft, a place of spiritual value to both the Sikhs and Hindus. It is believed that Guru Gobind Singh meditated there in his previous life after defeating a demon that terrorized both mortals and Gods. It is also believed that the hindu god Lakshman meditated by the lake and regained his health after being severely wounded by Meghnath, son of Ravana. So there is a Gurudwara and a Laxman Mandir by the lake. But for the five us Hemkund was synonymous with "more walk" and "more fun". Even Subbu had recovered well from fatigue, thanks to a special Uttaranchal kichdi and his own ginger treatment. So after the usual bathroom symphony and some sandwiches for breakfast, we started our Hemkund yatra by 8:15. The number of pilgrims were considerably less this time, probably due to few landslides and accidents in the Joshimath road the past few weeks. 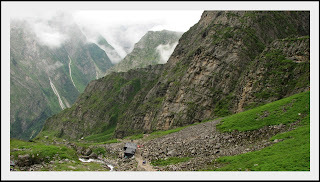 Hemkund is a 6 kilometer trek from Gangharia,a climb of 4200 ft. The valley of Flowers trek route is a cake walk compared to the one to Hemkund. With every turn of the winding road, Gangharia and Lakshman Ganga become a smaller and smaller speck in the valley. The landscapes around are really beautiful with a lot of flowers of all colors. 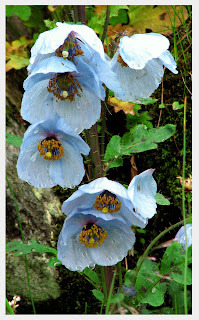 We could locate the elusive Himalayan Blue poppy at a few places along the route. It was drizzling right from the beginning, but not strong enough to cause us any trouble at all. The raincoats we bought at Govindghat for Rs. 25 proved more than enough to keep us going. In the first 2 hours we covered only about 2 kilometers. But then Rob came up with a 'strategy' to make the climb a lot easier. If you take short steps, keep chanting something and get into a rhythm, the climb gets a lot easier. You can either count to 100 or say 'waheguru' or if your girlfriend ditched you recently, you can pray for her good life. (Yup, it did work for some of us!! ), We met a guy at the halfway mark who said he didn't even stop once since he started. This was when we were taking our 43rd scheduled stop for the multivitmin tablets. Its amazing how religion can make people do the impossible. 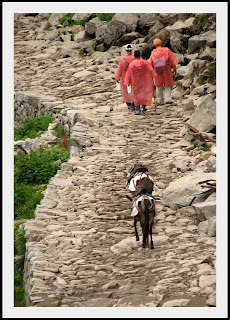 There were 70-80 year olds who were climbing the hill barefoot, while even a lot of youngsters were preferring ponies. Some of them make this trip every year it seems. As one of them said "if guruji brought me to the foothill (Gangharia) from so far (Punjab), he will definitely take care of this as well". I just nodded my head, trying hard not to look pale and breathless. Complete surrender to faith is blissful I suppose. The moment you convince yourself that all decisions on your behalf will be made by an infallible higher authority, life becomes much simpler and easier. Towards the last part of the trail, there are two options to go ahead - either take a flight of steps or take a longer winding stone paved path. I chose to take the longer route as it looked more scenic. There was one another thing I wanted to see during this trek - the Brahmakamals. 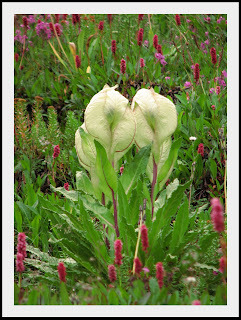 They are big white lotus like flowers that grow only in these high altitudes and I was looking all around to spot at least one of them. As I walked on, when the mist suddenly cleared off the nearby mountain slopes, I couldn't believe my eyes. There were thousands of Brahmakamals all along the slopes. I was hoping to find one flower here or there if I look carefully enough, and this was more like a sea of them. Then I also spotted a few among the rocks just ahead of me. I ran towards them with my camera and managed to get few good pictures. All through the rest of the way, there were plenty of them on either sides of the trail. There were also patches of maroon and yellow Potentillas, Geraniums, Asters and Balsams. If you take the steps you will get a closer look at the waterfall while the longer route has a lot of flowers ang greenery around. After 5 hours of climb, we finally reached Hemkund. Its a beautiful sight to behold, the lotus shaped gurudwara by the lake, surrounded by mountains. The Hemkund lake is fed by small streams and glaciers from the mountains around and has crystal clear water. The water in the lake is holy for the Sikhs who take bath in it to wash away their sins. We couldn't even wash our face in the water as it was freezing cold. The gurudwara serves some real good hot tea and a special kichdi made of pulses, to all those who visit there, which is in fact a great relief. After having a round of tea, we entered the gurudwara. Its a nice place to escape the cold as they provide nice blankets in there. It is an experience to sit there listening to the chants, wrapped in a hot blanket. The Guru Granth Saheb was kept on a raised platform and there were a bunch of punjabi singers singing bhajans. Nobody except the volunteers are allowed to stay at the Gurudwara overnight. Everyone start their descend by 2 in the afternoon and so did we. I took the steps on my way back, which was more taxing on the already battered knees. But with the kind of scenes around, we never thought of our legs or knees till we reached the hotel. It was a tiring but rewarding day. After a quick bath, we went out for a walk and watched a documentary on the Valley of Flowers, at the Eco Development Center office. After a round of Gulab Jamuns and Samosa chat, we ordered dinner - Rob had Maggie noodles like the last two days, Yuvraj had just a soup for the third straight day, Subbu and Jayan shared some rice and rotis. I was plannning to eat less and had just 4 rotis! But we all made sure that we digest the food before we sleep - so we started singing the theme song of the trek... 'How do you solve a problem like Subbu..."
Last night at Gangharia, the verdict was unanimous... we will be back. The plans were quite ambitious that some were thinking about bringing their kids to the valley for science projects!! Who knows what future holds, perhaps our next trip might even be on Subbu's chopper..! !